Backyard fruit trees can yield a delicious and healthy return. Though they're not difficult to maintain, fruit trees do require regular care to ensure they're healthy and productive. 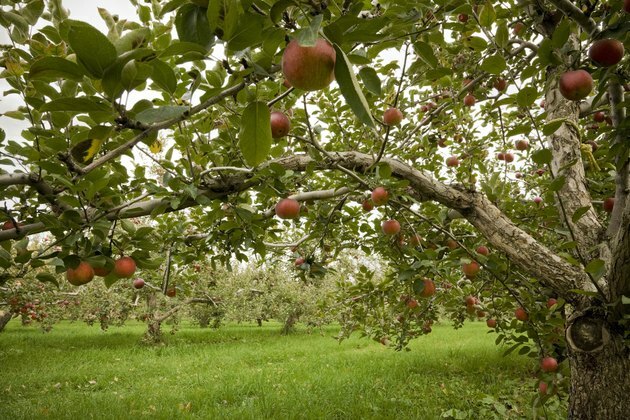 Choose fruit trees that produce best for your climate. Apples are the most popular of the home grown fruit trees and the different varieties thrive in different climates. On the other hand, citrus fruits don't enjoy cold weather at all and prefer warm temperatures. Cherries and pears can withstand cold winters and hot summers. It takes patience to grow fruit trees as they can take years to bear fruit. Some trees such as peaches and nectarines can produce fruit within a couple of years of planting, while most other trees can take five to seven years to bear fruit. Before planting fruit trees, it's a good idea to brush up on pollination. Self-pollinating trees don't require cross pollination to bear fruit. Apricots, peaches and nectarines are examples of self-pollinating trees, which can be planted on their own. Most citrus trees also don't require cross pollination. However, apples, plums and pears are cross pollinating and won't bear fruit unless they're planted in groups of two or more. It's also important to note that cross pollination has to occur between two different but compatible varieties of the same fruit. Thus, when buying one cross pollinating fruit tree, you'll have to buy at least one more tree to help with cross pollination. You can research companion trees online or ask your gardening professional. Because trees pollinate when they're producing flowers, compatible cross pollinating varieties have to bloom at the same time. If you're unsure of which trees to plant together, seek the advice of a landscaping professional. Plant compatible trees within 50 feet of each other for pollination to occur. Plant fruit trees in the early spring when there's no danger of frost and they're still dormant. Choose a sunny spot with well draining soil. Dig a hole that is wide enough to accommodate the root ball and allow for growth, about double the size of the pot that held the tree. Gently spread the roots before placing in the hole and backfill with soil once the tree is in the ground. Cover the earth with slow-rotting mulch and water well to establish roots. Stake young trees to the ground to ensure they stay upright during wind and inclement weather. Prune fruit trees in the winter when the they're dormant. Trim off dead or overgrown branches but do so sparingly to avoid over pruning. As fruit trees need to use their energy to bear fruit, pruning too many limbs can cause them to expend energy growing branches instead. Fruit trees are prone to fungus and attract pests. Seasonal spraying for both is helpful to avoid infestations. Each fruit tree has different requirements so check with a gardening professional for the best products for your tree. Water fruit trees at the base so roots can easily soak up the water. Sitting water on leaves and fruit can bring on rot. Mature trees don't require as much water as young trees, but they do appreciate periodic watering in dry conditions. Mulch helps to keep soil moist and protect the roots from frost.